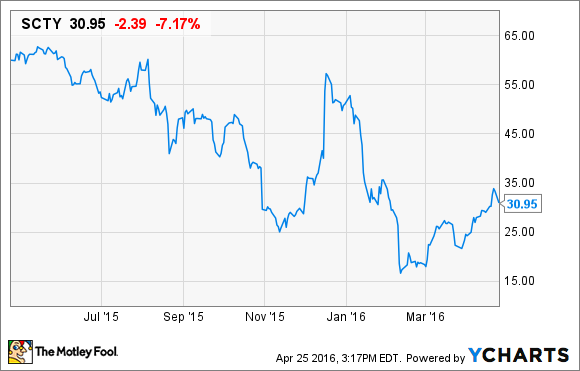 Can SolarCity Corp. Reignite Its Growth in 2016? It won't be as easy for the company to boost its sales of residential solar power systems as it has been in recent years. But the reason why is actually good for the company long term. SolarCity's (NASDAQ: SCTY) stock has lost nearly half of its value in the past year as the market has begun to question the company's ability to keep growing at breakneck speeds. In the fourth quarter of 2015, installations grew 54% year-over-year to 272 MW, but in Q1 2016, the company expects just 18% year-over-year growth to 180 MW -- a 34% sequential decline. Still, the company says it plans to grow installations 44% for the full year to 1.25 GW. Which makes the obvious question: How can SolarCity get back on that growth track? 2016 was supposed to be an incredible year for the solar industry. The solar investment tax credit (ITC) for third-party owned systems (of the type SolarCity offers) was set to be reduced in 2017 from 30% to 10%. Based on that, it was expected that customers would have rushed to go solar before the tax benefit was cut, creating an incredible amount of demand for companies like SolarCity. And while that might have meant 2017 would be rough, solar companies would have dealt with that when the time came. Instead, Congress passed another ITC extension in December that keeps the 30% credit intact through 2019, then cuts it to 26% in 2020, and 22% in 2021, before ending it for homeowners altogether in 2022. That legislation created more consistency for SolarCity's business into 2017 and beyond, but it means solar won't enjoy that crushing demand growth this year. Ironically, investors should see the extension as a great benefit for the business long-term, but a negative for 2016 growth because it reduces urgency for customers. It's a blessing and a curse. If SolarCity is going to grow 44% as it plans in 2016, it'll have to find ways to reach more customers without spending more on sales and marketing. Since the fourth quarter of 2013, the cost to sell a watt of solar systems has risen from $0.43 to $0.56, which has eaten up a lot of the cost reductions the company has made on the installation side. And at this point in the game, sales and marketing costs should be falling, not rising. The challenge is that the company may have to lower prices or enter new markets that are less attractive economically to gain the new customers it needs to meet its growth targets. This is the trade-off between growing and making money: SolarCity has been a growth story for a long time, but now investors are demanding that it make money, or at the very least become cash flow break-even. Those two things don't always work together in the solar industry. The company may have to give up margins to grow in 2016. I think the best way to grow installations in 2016 would be to introduce new sales offerings, particularly compelling loan terms. Data is starting to suggest that as the industry gets more competitive, selling solar systems at competitive prices with competitive loans will become far more common, and save customers more money than today's lease or power purchase agreements. Today, SolarCity is almost completely reliant on leases and PPAs after eliminating MyPower, a loan product that looked a lot like a PPA. The problem is that selling systems could lead to falling margins. Whereas SolarCity said it was generating $0.93 per watt in net NPV on top of its $2.71 per watt costs, or a 26% margin if values hold up as projected, it may have to settle for margins in the teens (as its competitors report) if it's competing with other installers. Adding a compelling loan product would be a risk, and would change the company from a long-term power company to a regular solar installer. But it may be a necessary move in today's environment, and it could help SolarCity boost growth. Will SolarCity hit its targets in 2016? SolarCity's management has said it will hit its goal of installing 1.25 GW of solar in 2016, despite guiding for just 180 MW in the first quarter. That's a big goal and will require a return to growth rates above 50% in the final three quarters of the year. I've outlined how the company could get there, but for long-term investors, there needs to be a focus on margins as well. Growth is great, but if it isn't combined with making money, it won't matter. And that's a balancing act SolarCity hasn't quite perfected yet.